When your coffee and espresso machine’s heating elements are compromised by mineral scale build up, water does not heat to proper coffee brewing temperature, causing coffee to taste bitter. Full Circle Descaling Powder removes mineral build up such as lime scale from the heating elements of your machine. Without regular descaling, your coffee maker can become clogged, water becomes cloudy and overall performance and taste is diminished. Full Circle Descaler does not leave behind the lingering smell and taste of vinegar and contains only non-toxic ingredients. Descale once a month for coffee and espresso equipment that operates at its best and enjoy better tasting coffee! Includes 2 single use packets. SAFE - Non-toxic, biodegradable and phosphate free. 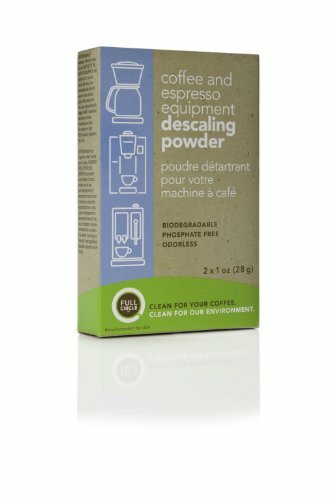 MULTI-USE - Use for reduction of scale and mineral build up on single use machines, coffee pot machines, and espresso machines. Vinegar is not as effective as Urnex in removing scale and build up. Decalcifier for espresso machines. FOR REGULAR USE - By cleaning your machine regularly, you improve your machines life. For best results use every one to three months to keep your machine clean. Please use with Keurig 1.0 Keurig 2.0 Delonghi Nespresso Ninja Hamilton Beach Mr. Coffee Braun Bunn Tassimo Varismo Krups Cuisinart Saeco Senseo and others! If you have questions, please message our customer service.